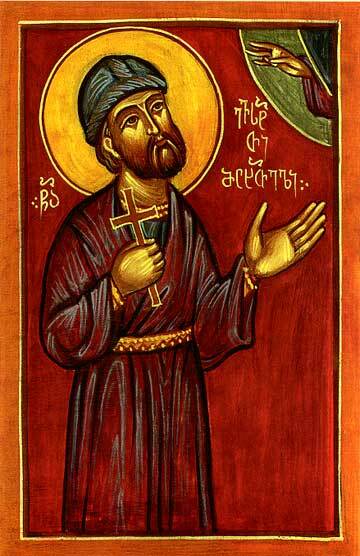 The Holy Martyr Eustathios of Mtskheta was descended from a long line of Persian fire-worshipping pagan priests, and prior to Baptism he had the name Bgrobandaves. His father and brothers, serving in the Zoroastrian cult, attempted to make a pagan priest of Bgrobandaves, but in vain. During the reign of the Gruzian (Georgian) emperor Guram Kuropalat (575-600), at age 30 he resettled from the Persian village of Arbuketi (near the city of Gandrakili) to the ancient capital of Gruzia, the city Mtskheta. He earned the means of his livelihood in the sandal trade. Saint Eustathios began often to visit the Mtskheta cathedral, where the Christian Divine-services filled his soul with an inexorable delight. Archdeacon Samuel (the future Katholikos-Archbishop Samuel IV, 582-591), having noticed the spiritual proclivity of the Persian pagan, spoke with him about the Christian teachings. Having then come to believe in Christ, Bgrobandaves accepted to be a catechumen under Archdeacon Samuel, and after a certain while, when Samuel became Katholikos, he accepted Baptism under him with the name Eustathios. Eustathios then married a Christian wife, and led a pious life, abundant in virtue. Fellow Persians, living also at Mtskheta, were unable to sway Saint Eustathios into a return to fire-worship, and so they persuaded the Persian head of the city to have him sent to Tbilisi to Arvand-Gubnav, satrap (vicar) of the Persian shah Chosroes Nushirvanes. Dispatched to trial under the satrap together with Saint Eustathios were likewise other Persians, who had accepted Christianity: Gubnak, Bagdad, Panaguznas, Perozav, Zarmi and Stephen. Two of these, Bagdad and Panaguznas, under the fear of death, renounced Christ. Saint Eustathios and the remaining confessors honourably underwent a six-month imprisonment and through the intercession of the Katholikos Samuel IV and a Gruzian notable, they were set free. The new satrap of Persia, Bezhan-Buzmil (appointed to Tbilisi three years later), at the instigation of the former enemies of Saint Eustathios, gave orders that he appear, and demanded that he renounce the faith in Christ and return to fire-worship. Saint Eustathios gave a dignified reply: "Can one forsake the Creator of all and worship but a creature of His? Never should this be! Neither the sun, the moon or the stars are in essence gods, but rather God did create the sun for brightening the day, and the moon and the stars, that they might shine in the darkness of night... And fire is not the Divinity; wherefore fire is produced by man and by man it is extinguished". By order of the satrap, Saint Eustathios was beheaded on 29 July 589. Before accepting the crown of martyrdom, on bended knee he offered up a prayer, beseeching the Lord, that after death his body be given Christian burial in the city of Mtsketa. The passion-bearer heard the Voice: "With nothing wilt thou be less than the first martyrs, neither with grace nor with healings, wherefore about thine body be not concerned, but it shalt be, as thou hast requested". The body of Saint Eustathios, cast out by night upon a field, was conveyed by Christians to Mtskheta and with great honour placed by Katholikos Samuel IV beneathe the altar-table of the cathedral of Svetitskhoveli. The Katholikos Samuel IV established the memory to him on 29 July, the day of the glorious death of the holy martyr.